Chest pain is something common that everyone in their lives would have experienced it. Gas when trapped in the body causes excruciating pain and gives false notions of heart attack. Eating a certain food sometimes results in the formation of gas in the stomach or intestines. 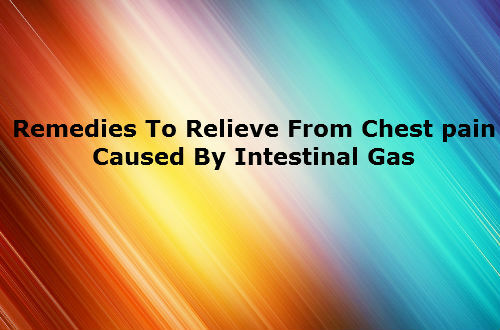 When excessive gas gets formed in the intestine or stomach it moves towards the chest and causes pain. People are in the habit of taking in air whenever we open our mouth. We open our mouth whenever we speak, laugh, eat and lie down. So air gets inside our mouth and excess air gets formed as gas. If one is suffering from this, then they are likely to develop gas in our body. Similarly those who suffer from irritable bowel syndrome also develop gas inside their bodies. Some bacteria in the intestine ferments the undigested food. This causes gas to be formed in our body. Fibers are good for the human body especially for those suffering from constipation and irritable bowel syndrome. It removes the toxins and controls cholesterol. It is also used extensively in weight loss programs. However excessive fiber results in the formation of gas in the body. Some carbonated drinks like soda can cause gas formation. There are some foods which are digestible to some and not to others. We should be careful in choosing the right kind of food for us because undigested food causes the formation of gas. If the gas does not associate with pain it may relieve after a period of time. If it pains it may be serious or may be associated wrongly for other problem such as gallbladder stones and strokes etc. While it is normal for a person to pass gas in a day, it should not accompany with pain in the abdomen area. Gases are passed due to the improper digestion of foods. Water helps in digestion. If the food is already digested it helps in flushing it out of the body. We must drink at least 10 cups of water a day though it may vary from person to person. Certain foods like mustard, cumin seeds and turmeric stops the forming of gas. Instead we must take those foods instead to pass gas out. Apple cider vinegar must be mixed with a cup of water and drunk before dinner. It helps in digestion and passing out of gas. When we feel pain in any area of our body we must feel tom lie down in a position that relieves us from pain. Tea relieves us from pain. Green tea helps in flushing out the free radicals from the body. Peppermint tea helps in getting relief from pain. Adding few drops of cinnamon, ginger and peppermint actually helps in relieving gas in the form of a belch from the lungs. Carbonated drinks form gas in our body. When the gas passes from one part of the body to another pain is experienced. Drinking hot fluids like coffee or tea helps in moving the gas from the intestine to the outside. There are some fruits that heat the body and burn the gas accumulated in the body. One such fruit is papaya. Improper physical activity also forms gas. When we physically strain ourselves then the food gets digested and no gas is formed. These help in the prevention of bloatness and flush the body of the impurities. Drinking a cup of hot water with baking soda mixed helps to relieve ourselves from gas. Dairy products mostly cause bloat and gas formation in the stomach. So avoiding them helps to lead a healthy and happy life.